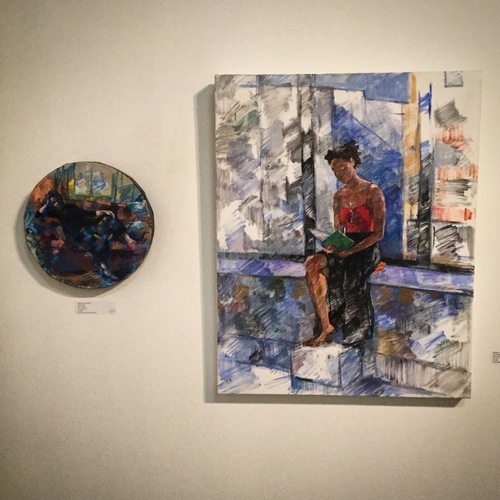 My Self Portrait/Tondo (oil on linen, 12" diameter) was on view at the Citi deFord Gallery as part of a juried group exhibition featuring artists who work in Queens. This self study is set in the studio in Dordogne where I lived and worked for a month. It was a time of reflection and total immersion in my work. The tondo is a favorite shape for my work including florals, landscapes and portraits. I find it both fascinating and a challenge to create circular compositions. These two paintings were part of an exhibition of artists who work in Queens. The painting on the right "The Green Book" depicts the model in my studio in Long Island City. The circular self portrait is set in a studio I had in Dordogne, France. The works are deeply concerned with light and expressing a state of emotion in paint.